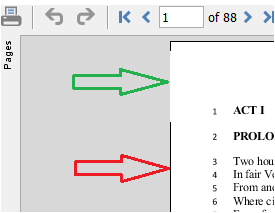 Q: Is it possible to remove the black border around pages in Qoppa’s PDF component? See screenshot below. A: Yes, it is. See code sample below. Modifying the border we use on page view components can be done with an IPDFListener after the document is opened. Also the documentChanged() method needs to be overwritten to modify the border on any new pages.